Over the last seven months, fighting has intensified between the Myanmar Army and ethnic armed groups in Kachin and northern Shan States, areas with long-running conflicts as ethnic minorities have sought greater autonomy and respect for their rights. This report documents war crimes and other human rights violations by the Myanmar Army, including extrajudicial executions, torture, forced labour, and indiscriminate shelling. Most victims are civilians from ethnic minorities in the region, continuing a legacy of abuse that has rarely led to accountability for the soldiers or commanders responsible. The U.S Department of State, Bureau of East Asian and Pacific Affairs hte US Kachin community ningbaw ni daini March 28, 2017 hta Washington DC na US Department of State Rung hta zuphpawng galaw la lu ai. Lahkawng maga de nna shachyen shaga ai hte sa du hkrumzup lu ai majaw chyeju dum ai lam tsun let zuphpawng hpe hpan sai. N-pu na lam ni hpe rau jawm bawngban jahkrup lu sai. 3. Malaysia hte Thai kaw nga ai Kachin refugees ni hpe lawan Amerika de shaga la na lam hpe hpyi shawn ai hte shanhte a jahpan ni hpe mung PRM de shalai ya na matu up jaw ai. 6. Simsa lam the seng nna Myen mung kaw galaw nga ai lam ni hpe tsun bawngban jahkrup ai lam. 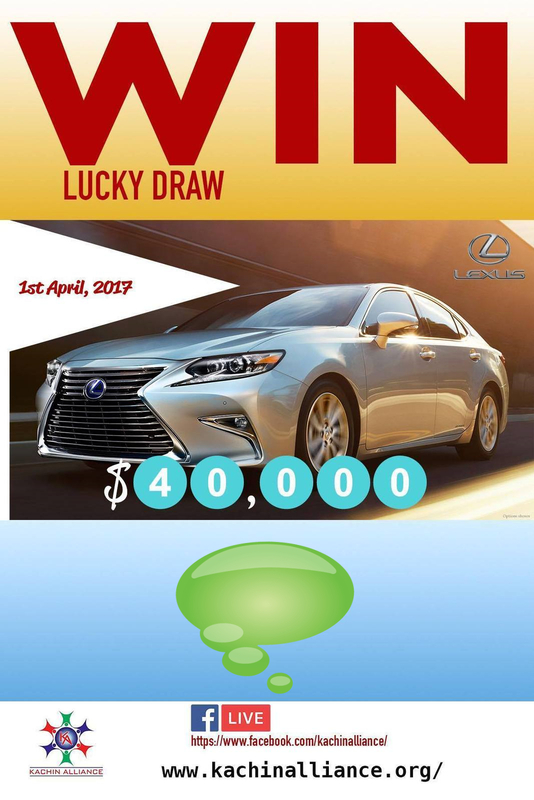 Thank you for supporting the Kachin Alliance by participating in the Lucky Draw Fundraising event. On April 1, 2017, we will celebrate the success of the fundraising and draw the winning ticket at our Washington DC office. The event will be from 1 PM – 3 PM EST. starting at 1:45 PM EST. Amerika mungdan hta du nga sai Jinghpaw Wunpawng Myusha ni a masha jahpan hpe Kachin Alliance kaw na woi awn let hta shing gyin nga ga ai. Ndai mying jahpan hta ai lam gaw anhte Wunpawng Myusha ni yawng a ahkaw ahkang, masa lam a matu ahkyak langai rai nga ai. Masha jahpan hta hpang ai kaw na 2016 December shata du hkra lu hta la lu ai jahpan chyarang (statistics) ”lawu na Sumla kaw yu ga”. Jahpan ndai ni hpe aten law law jaw let shakut hta shing gyin ya ai State Lithkam ni hte jahpan bang shanglawm ai nuwa myitsu ni yawng hpe ,Grai chyeju dum dik ai lam tsun mayu ai. Jahpan grau hkum tsup wa na matu matut nna shanglawm ga, ngu nna saw shaga dat ga ai law. Lawu na shaleng dan da ai lam gaw lu hta la lu ai jahpan hpe mahta nna maram da lu ai jahpan chyarang (statistics) re.